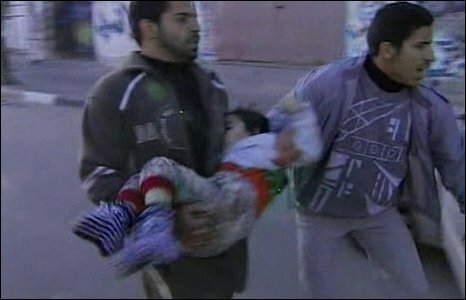 Picture from after the attack of UN run international school in Gaza. Picture from BBC. The Gaza conflict makes me even more angry than so many other international conflicts. I think what makes me fume is that America supports Saudi Arabia so strongly, overtly and unconditioned – America that claims to be on a “Nation Building” & “Democracy Exporting” Crusade. Palestine is definitely more democratic than any little bit of desert in Saudi Arabia! And think of the Sauds who were allowed to leave the US during the flying ban after 9/11. And consider that there’s every proof you’d want that it’s the Saudis who finance most of the religious madmen in the Arab world and thus more or less pushed Hamas into power. Because at the same time as supporting Hamas and all the other religious nutters, they – and the US and Israel – have done everything to discredit Fatah. It simply defies belief that the whole world is standing by and idly watching this! Today’s story about the Israeli “proof” that they only shoot at “legitimate” targets – the Youtube video with the “missiles” being loaded onto the truck – is probably only scratching the surface of the deception the Western press gladly falls for. A Washington Post story from right after the Hamas take-over. Here’s evidence of Saudi Arabia financing terrorism, which was delivered to the American senate in 2003. Here’s some back ground information about Saudi Arabia, Wahabism and terror financing from the Independent. Wikipedia’s article about Wahabism (state religion in Saudi Arabia). And here about the House of Saud, who rule Saudi Arabia. A bone chilling story from Vanity Fair about the US deepening the crisis in Gaza.